Get In The Game - Register Now! Visa, MasterCard, American Express, & Discover are accepted. For ages 5 thru 18, late registration begins July 23rd - BASC will continue to take player registraion until all teams are full. Once all teams are at capacity, if BASC cannot place your child, refunds will be given - BASC will notify you in this instance. Do you have a 3 or 4 year old that wants to play soccer? If so BASC has the perfect soccer program for you! Broken Arrow Soccer Club’s KICKSTART Program is designed for the 3 and 4 year old player and is focused on creating a fun and positive atmosphere to learn the world’s most popular sport of soccer. Cost of KICKSTART Program: Fall Soccer is $85. All players registering with BASC for the first time must provide proof of age, typically in the form of an government issued (not hospital issued) birth certificate or passport. A scanned copy may be emailed to emily@bascok.com or faxed to 918-516-0664. Follow the links below for more information. Soccer Parent Q & A – CLICK HERE! Click Here for more information and the BASC policy regarding special requests. Click Here for BASC Practice Information. Schedules will be posted around September 4th on the BASC website click "Schedules" unter the "Programs" link on the top menu bar of our homepage. First game of the fall soccer season kicks off Saturday, September 9th, 2017. WOULD YOU LIKE TO BE A SOCCER COACH? To further and promote the progressive development of the sport of soccer for the youth of broken arrow and surrounding areas through the establishment and development of youth programs, training and education. 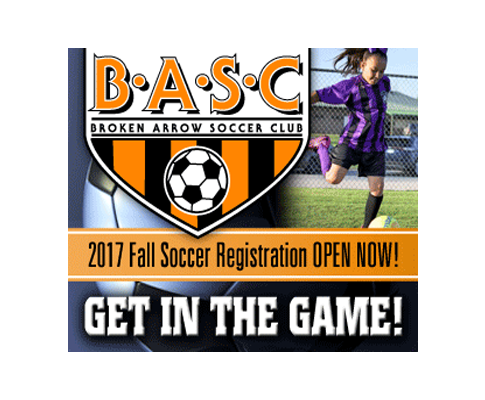 Broken Arrow Soccer Club is celebrating our 43rd year in 2017! We are the largest club in Eastern Oklahoma! We offer program for kids from 3 years old through 18 years old. All Northeast Oklahoma area players are invited to register with BASC!